First, an apologetic note. As I write this, it is now 7 weeks since we arrived in New Zealand, and I'm sitting here in Las Vegas ("Vegas, baby!") no less. Shocking. So unfortunately (or fortunately, depening on your point of view) the text will be shorter than it might otherwise have been. And without the benefit of heather's insight. Click here to see a map of New Zealand in a new browser window. j: To Auckland. No wait, make that Christchurch. Shortly before we were due to land at Auckland International Airport, we had to circle due to some crisis on the runway, which we later learned was a Singapore jet that had mashed its tail section on takeoff and had to make an emergency landing. Well, they diverted us to Christchurch for a fuel stop, and we asked if we could get off there instead -- doing our tour of NZ in reverse, and saving having to buy a domestic flight. They were surprised, and said our luggage could take 24 hours to get there, but they let us, along with two other couples, get off and pass through our own personal customs. I was impressed that a local bus drives the 25 minutes into town for NZ$4, and, get this, even has a luggage compartment underneath! Kudos to Christchurch transit people. The big snag was the local AYH hostel was full, as were almost every other hostel, and fancier digs, that we tried calling. Some other guys in the same boat found another non-AYH hostel about a 20-minute walk away, and they even had a room for us -- for one night. As we walked there, we saw "no vacancy" signs everywhere. It turned out to be a decent place, just further from downtown Christchurch than ideal. We walked back into town for dinner, mostly along a crystal-clear river (astounding in the middle of a 300,000 populated city, and became a theme of NZ), to a street we had passed in the bus, listed in the guidebook, and coincidentally at a highly-rated-by-the-guidebook restaurant, where indeed the food was quite tasty, albeit expensive after SE Asia. 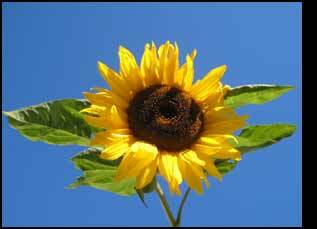 While it was chilly at night, the daytime temperatures and sun were pleasant. The New Zealand dollar was worth about US$0.56, or to put it the other way around, US$1 was worth NZ$1.79, roughly. Which meant for us things were cheaper than back home, but nowhere near as cheap as SE Asia. j: Christchurch is a cute English-influenced town, with a charming downtown core including a cathedral, a cafe-lined pedestrian street and an old circular streetcar route. This morning we called the friends we had met in Thailand (remember the lost wallet story?) and they were most gracious, agreeing to host us that night. First we took the bus back out to the airport to pick up our luggage which had already arrived that morning, stopping to eat near the airport at "Untouched World," which has a nice courtyard restaurant and fresh, organic well-prepard food. For a price, but not outrageous. Disappointing was the fact that the large store, to which the restaurant was attached, seemed to hint that it had some charitable notion behind it, but didn't really, and had sky-high clothing prices to boot. They did, however, provide us a free shuttle ride to the airport, where we picked up our luggage, and, get this, were able to ride the bus back into town on the same transfer, as we were still within our two-hour window. We met Richard at his office in downtown Christchurch, and he drove us out to their house, where Josie was working on her pottery. Later that afternoon they drove us up into the hills to the southeast of Christchurch for some would-be-spectacular-sunset-views-on-a-better-day. However, we were able to look out west towards the Banks Peninsula. As an interesting side-note, Richard and Josie explained that Christchurch suffers from a winter temperature-inversion phenomenon which cause atrocious air quality. Luckily it was still autumn in New Zealand. Richard and Josie prepared a wonderful meal back at their house, and we fell asleep in the nicest bed of the whole trip. The next day was a relaxed, do some laundry kind of day. I walked downtown (about 30 minutes each way) to take care of some little things which I no longer remember (so why do I bring it up now?). The day after that I picked up the rental car. I'm sure we had a lovely time doing things with Richard and Josie in the evenings, whatever that may have been. The day after that was spent driving out to the little town of Akaroa on the Banks Peninsula, one and a half hours away or so. Cute little waterfront downtown area. Lovely scenery, especially when we took a side road up into the hills. Heather even suggested scrambling up the last bit of peak to get the full on surround view -- after all, there were cow tracks. So what if we had to hop a fence after parking the car in front of a seldom-used gate. We tried to go to both a cheese factory (cheesery?) and a winery, but they were closed! At 5pm! Shocking! Oh well, we weren't exactly in wine country yet anyways, and Heather decided I might be becoming lactose intolerant since I had less stomach problems in SE Asia than I did in Australia or NZ, with the main difference in diet lying in cheese and dairy products. That evening back in Christchurch, we went to a delightful restaurant in town, suggested by Richard and Josie, which while not inexpensive, did have excellent cuisine. j: Punakaiki. We set off from the house relatively early, but by the time we had breakfast in town, stopped by used book stores to exchange books, and hit an Internet cafe, it was pretty much noon already. 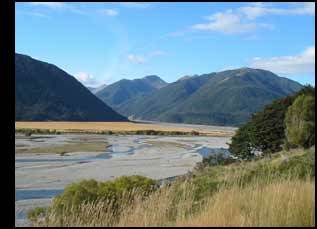 Highway 73 goes coast to coast from Christchurch to Greymouth, crossing the Southern Alps via Arthur's Pass. OK, so coast to coast as the crow flies is only 200km (120 miles) or so, but it takes a good 4 hours to drive. Once we were past the little towns and entered into mostly undeveloped territory in the interior of the island, the scenery took over. Flat plains surrounded by mountains and cut through by rivers. We stopped for a roadside picnic in view of a sacred Maori limestone outcropping park half way across the island, shortly before ascending towards Arthur's Pass and ski country. We thought the plains and mountains were lovely, but the west coast - wow! 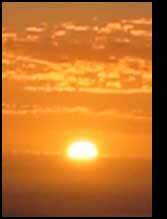 And great sunsets too. Our hostel, in Punakaiki which is 40 minutes north of Greymouth, turned out to be a converted older lodge-like house with no locks on the bedroom doors, in a tiny town, a five minute walk from the end of a scenic trail -- the end being on the coast, of course! We arrived just in time to go watch sunset from the rocky cliffs. Unfortunately we hadn't brought food to fix for dinner, and the pickings in "town" were slim -- we ended up eating an overpriced unexciting meal at a smoky local tavern. 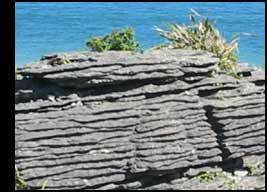 The next day we went to see the famous "pancake rocks" and "blowholes," which weren't what either of us expected. I had envisioned flat rocks in the sea somewhat like tables, instead they were tall layered rocks, often at the top of the cliffs not directly carved by the sea anymore. 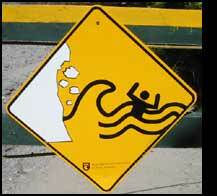 And the blowholes weren't blowing -- you need high tide and strong westerly winds. Actually the coast reminded us of the Great Ocean Road in Australia. Afterwards we drove 40 minutes back to Greymouth to get some groceries for dinner, as well as some cold remedies for Heather. 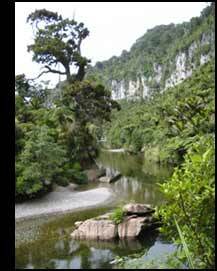 And back to Punakaiki. The afternoon was spent lounging and reading in the hammock, at least until the sand flies showed up. They're everywhere! And another gorgeous sunset on the coastal cliffs. That night we met an Irish couple on their extended world-travel honeymoon, who were travelling for this portion in NZ with his mum and her friend. As it turns out, we'd run into them a few more times, as they were following a similar tourist trail. j: To Franz Joseph Glacier. Well, first that morning we walked up a river trail, which true to Richard and Josie's description, felt like walking back into prehistoric times, minus the dinosaurs. Of course our digital camera's batteries died on this walk, and the spares were back in the car, although I almost always carried the spares on me. We could have spent much more time at the river, but we wanted to get down the coast and to the glacier town. 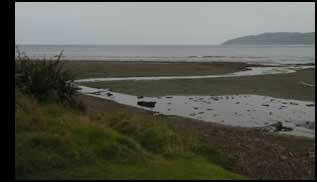 So we did a small walk up the river and back, then followed the river to its mouth on a deserted gravelly beach by the sea. Along the way down the coast, we stopped for a picnic lunch at the side of a pristine lake with views of distant mountains, a mere few hundred meters from the highway. That's highway, not freeway, most of the time just one lane in each direction. And with lots of single-lane bridges, reminding me of the road to Hana in Maui, but less tropical. In any case, there were so few cars on the road that it didn't present a problem, and in fact we only seldom had to stop to allow another car first passage. 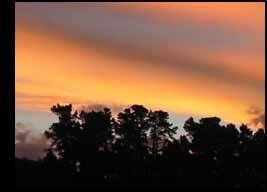 We arrived in Franz Joseph Glacier -- the village -- in the late late afternoon, so a quick trip to the grocery store for dinner vittles to cook at the hostel and the evening was over before we knew it. j: Franz Joseph Glacier. Since Heather was still not feeling well, I signed up for a half-day hike up the glacier by myself. It was a cloudless day, but unfortunately the helicopter tours were already booked up. We started out by trying on their boots with complementary wool socks, since they have special crampons designed for their boots. Then we loaded into a bus for the 10-minute drive to the parking lot nearest the glacier, lugging our crampons in fanny packs. A few minutes walk brought us to the viewpoint, complete with a yellow warning-possible-floods sign forbidding us to continue, which our guide promptly ignored. He explained that a hole had developed in the glacier and indeed some flooding had happened, but the danger was long gone and the signs were at least a week old. The path along the gravelly landscape was a good 2km long, even though the glacier appeared to be much closer. The guide stopped every now and then to give us a bunch of factoids, including how fast the glacier had receded in the past few years, making it much longer to get to "his office" on the glacier every day. The ice-cold river here was not glacier-blue as we would see many other times from the road, but rather very milky gray due to the high quantity of glacial flour -- a suspension of finely ground rocks. Once we climbed on to the terminal moraine, the leading edge of the glacier, we donned our crampons which made the heavy boots even heavier, but provided sure footing. Then it was time to play for two hours on the glacier, as our guide led us around and pointed out various ice formations and features. It was all very interesting, definitely a must-see if you've never been on a glacier. j: To Queenstown. Before we left town, we walked to the glacier viewpoint so that Heather could see it too. 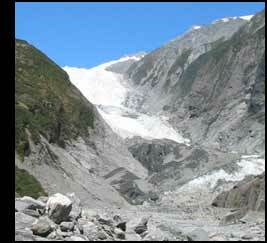 Then we drove 40 minutes south to Fox Glacier, which has equally impressive but different views of the glacier. We ate a tasty lunch in the nearby village on an outdoor patio in the sun, followed quickly by shade as the sun was too hot. Then we took a walk around a tranquil lake reputed to have the best view of the glacier, complete with reflections on the water. 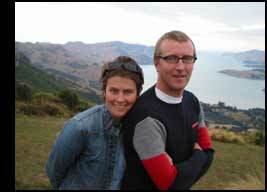 Then we settled in for a long drive to Queenstown, stopping in the charming lakeside town of Wanaka (next time!) for dinner, arriving in Queenstown shortly before the hostel front desk closed at 10pm. 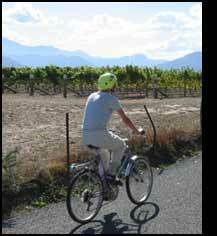 Queenstown is the adventure-sports capital of New Zealand, though we wouldn't actually take part in any of them. 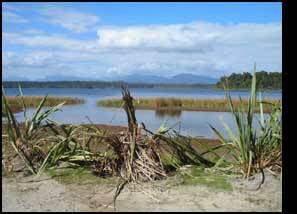 j: To Te Anau. 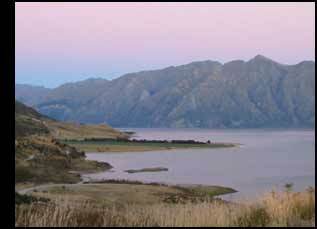 But first we drove 47km north along the lake -- yes, a long lake, for Queenstown is about in the middle! 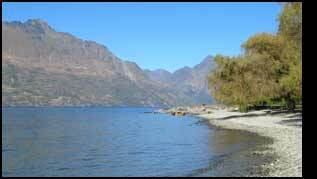 -- to Glenorchy, a quiet little town at the very north end of the lake. We sat and relaxed on a public dock, enjoying the sun and the tranquil setting, if you ignore the occasional jet boat coming back to roost at the neighbouring dock. A nice area worthy of more exploration and time; unfortunately we did not have enough time, which was a central theme in New Zealand -- we must go back for several months some day. After an exasperating fruitless search for an Internet cafe in Queenstown that allowed laptop hookups or even worked with our CD, we ate a picnic lunch at the waterfront park. Then we drove the two and half semi-scenic mostly rural hours to Te Anau, a small town on Lake Te Anau, mostly because we weren't able to get a private room at the Queenstown hostel two nights in a row, even though we tried booking a week in advance. That and it was a little over half way to Milford Sound, our next destination. There wasn't much to do there, though we did have a very tasty dinner of quality veal and lamb -- we had seen deer farms earlier that day, which had whet our appetites. We also booked a glow-worm cave tour for two days later, but more on that below. It was during this drive that we decided New Zealand would be great for handicapped people, as you can see such a great, varied terrain from the car without needing to step out (that, and the fact that our room in Franz Joseph Glacier hostel had been a handicapped-accessible one). 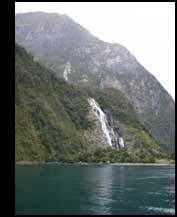 j: Milford Sound. After a lazy morning we drove the remaining 2 hours to Milford Sound, where the road deadends. This part of the drive was stunning, including valleys, mountains, waterfalls, a long tunnel through the mountains, and steep windy roads. So stunning I gave it its own slide show. 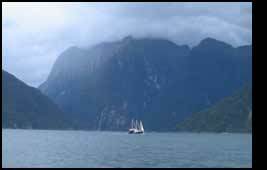 Technically Milford Sound is a fjord and not a sound -- the former is carved by glaciers, the latter by the ocean. Blame the original (white) explorers who named it. 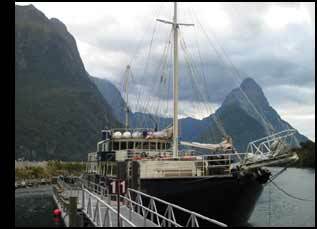 Our destination here was the Milford Sound Explorer, a boat that doubles as an associate hostel. In other words, we booked it through the hostel association including bunk beds -- i.e. a combined scenic cruise and onboard overnight stay! Needless to say, it was significantly more expensive than a regular hostel -- about NZD$150 (US$84) per person including two meals, vs around NZD$25 per person in a regular hostel double room. A budget buster, but worth every penny. As it turns out, there was a group from the Kiwi Experience bus on our boat that night -- which is to say, a bunch of rowdy twenty-something drinking partiers. This affected the ambiance on the boat. The boat left dock in the late afternoon, beginning immediately with soup and coffe, and doing a 2/3 tour of the sound/fjord -- gliding past very tall cliff faces and two waterfalls, including taking the nose of the boat into the spray where the waterfall hits the sea. This area gets 5.5m (20 feet) of rain per year, but unfortunately for us it was a dry day and had been unseasonably dry. This means that we only saw the 2 permanent waterfalls, instead of literally hundreds of waterfalls cascading off the cliffs. We then anchored for the evening and night in a smallish bay, where I took the option of kayaking around. You feel very small sitting in a little fiberglass kayak next to immensely tall sheer cliffs. A few of the aforementioned Kiwi Experience folks actually jumped from the top deck into the very cold water, and swam around for a few minutes. Brrr. Then a better-than-expected dinner was served, with some seconds available for those who needed more. Wine was available for purchase. We spent a pleasant evening playing some board games and chatting with the Asian couple with whom we shared a quad-bunk "room" -- a curtain instead of a door, and walls that didn't go all the way to the ceiling, which made it a little noisy. Nevertheless, it was a nice change to sleep on the boat and still worth recommending. j: More Milford Sound and Back to Queenstown. After an early breakfast on board, the ship motored the whole length of the fjord/sound, turning around out in the open ocean where the swell was noticeable. Today was cloudier and while we had a brief shower, we didn't get full-on rain -- in other words, no multitudes of waterfalls were created. The crew gave us commentary and factoids, and gladly answered questions. 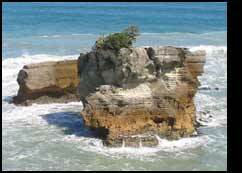 One that I remember in particular are the "travalanches" -- tree avalanches -- that scar the cliffs here and there. Basically one tree higher up dies or loses its footing and takes down an increasingly wide swath of trees and vegetation with it, all the way down to the water. This results in a triangular scar on the landscape, but fear not, the vegetation regrows and within a few months it won't look like a scar anymore. See the slideshows for a picture of this. On the way back to Queenstown, we stopped at the spectacular Chasm Walk with a really cool stream and waterfall -- see the pics in the slide shows. Then in Te Anau, we took a tour of the glowworm caves, which required a boat ride across the lake. Glowworms are the larvae of the fungus gnat; essentially their digestive system glows to attract flying food to their dangling sticky threads. What this all means is that in a damp, dark cave, the roof of the cave looks like a night sky, with hundreds of "stars" shining. Pretty cool. Unfortunately, but understandably, photography was not permitted in the caves. The first part of this particular cave had a cool clean stream running through it, and we actually had to take two different little pseudo-group-rowboats and catwalks, which is unusual as one can usually walk in the caves. We drove back to Queenstown that night for another quick one-night stay at the hostel, mostly, again, because it's too far to drive comfortably to our next destination in one day from Milford Sound. 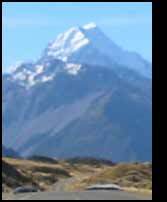 j: Mt Cook. On the way out of Queenstown, we happened by the jet boat canyon (see the slide shows) and drove a good four hours up towards Mt Cook, which is on the "back" or east side of the two glaciers we had previously visited. But first we took in the view of Mt Cook from the visitors center at the foot of Lake Pukaki, which had previously been created by an advancing and retreating glacier. Now this is a glacier-blue lake! Complete with a power-generating dam. The drive along the lake to Mt Cook was scenic, with the mountain itself popping into view around each bend, each time bigger than the last. The hostel was in the valley right below the mountains, offering superb views, especially from the patio. There weren't many dining options here, so I purchased frozen ground beef from the hostel's front desk and whipped up dinner in the busy hostel kitchen, practicing my limited Japanese on the plethora of Japanese visitors here. j: Back to Christchurch. We decided against a hike, so it was an uneventful day involving another long drive, save for a stop at a delightful cheesery in Geraldine, and going out to a nice Italian restaurant with our best kiwi buds, Richard and Josie, in Christchurch. Well, we did spend the night with them and retrieved the rest of our belongings we had stored there to lighten our load during the road trip. j: Kaikoura. With a final farewell to our newfound-in-Thailand kiwi friends, we headed north up the coast to Kaikoura, after the requisite morning run-some-errands-and-hit-an-Internet-cafe rush. Part of the road ran along the coast, with the train tracks running parallel on the inland side, passing through tunnels as the cliffs came right to the shore. The hostel was across the road from the water on this bay. Another home-cooked meal and laundry opportunity. Two tall Dutch guys with heavy accents were using the toaster oven (there was no real oven here) so I slipped my garlic bread in with their baked goods. After dinner we were heating a pie in the toaster oven, and while I was upstairs folding laundry or something, one of the Dutch guys approached Heather to tell her, in a heavy accent, "zee pie is buuurning." As you can imagine, this line became the inside joke between the two of us for several days, an excellent source of amusement. For dinner we prepared the lobster and a bottle of local wine (plus some veggies of course), and heather made a delicious dessert with the fresh-picked fruit. We met a German and French girl at our large table who were both working in local wineries, having similar work experience back home. j: Paraparaumu (North Island). In the morning, after grabbing some more fruit from the trees, we drove to Picton to catch the ferry to the North Island. Our local kiwi car rental company "Apex" arranges things so that you can drop off the car at the ferry, and pick up a new one on the other side, saving expensive car fares for the ferry. The coast and islands reminded me of the San Juan Islands back home -- which is to say, small forested islands with cliffs and rocky shores. The ferry was very comfortable, but only had a tiny outside deck in the back, since it was the faster catamaran ferry. Wellington, near the southern tip of the the North Island, is actually further south than Picton and the ferry goes mostly east from Picton to Wellington. In other words the islands are not stacked perfectly north-south. Wellington didn't seem to have too much going for it, so we headed straight up the west coast for less than an hour to our hostel at Paraparaumu, across the street from the beach/park. Nothing too exciting there, it was mostly to break up the drive to Lake Taupo. We had a sprinkle of rain, and I cooked dinner in the hostel sans bbq (well, they had one but the tank was empty). 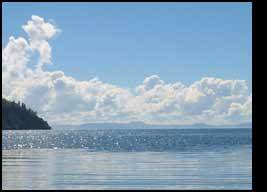 j: Tokaanu (near Turangi, at the southern end of Lake Taupo). The drive up past Mt Tongariro was quite lovely. On Richard and Josie's recommendation, we stayed in a little fishing lodge on the lake instead of in the hostel. It was very quiet there, but the grounds were nice, including a trampoline, the room had a kitchen, and best of all, it was close to free volcanic pools and bubbling mud. This area is also the trout-fishing capital of the world, of which we did not partake. We did find dirt-cheap New Zealand green-lipped mussels on sale at the nearest grocery store, combined with some nice wine, made for nice dinners. And oddly there was a resident sheep on the grounds, who followed me around a bit until I put my hand out in a "stop" position, and she did. The highlight was a free, little-known walking path by a multitude of volcanic puddles and bubbling mud -- see the slideshow for pics. At most places you have to pay for this privilege. Actually, all around us was evidence of hot springs, from the mist on the hills to the spring-fed hottub (exceedingly hot!) at the lodge, to the hot water running into the lake. 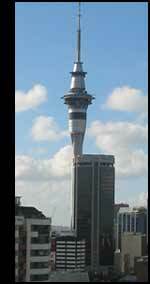 j: Auckland. Not the country's capital, but its largest city. In the northern half of the island, with salt-water harbours coming in from each side of the island, it's known as the city of sails. Mostly it seemed like another big city to us, and we were ready to head home. We walked around a bit, had a few meals on K Road near the hostel -- this is the "bohemian" area, a fancy dinner to celebrate the end of the trip. 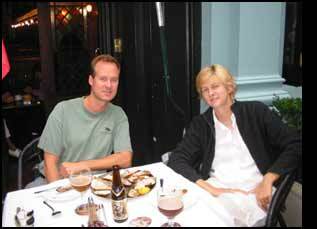 The happy couple on the right is us enjoying pre-dinner drinks and appetizer at a pub on a pedestrian street. Overall we really enjoyed New Zealand, and would definitely like to come back -- for much longer next time. It's a beautiful country. New Zealand, as well as Australia, had a lot of clever anti-drinking-and-driving billboards, such as "don't drink and DrIvE." j: Home, James. We took a city bus from the hostel to the airport, winding its way through suburbs before taking a bit of freeway. At the airport we were disappointed to not get business class seats -- a risk we had taken when we used our frequent flyer miles. And thanks to the miracle of the international date line, we arrived tired back in Seattle, via Los Angeles, on the same day we left.